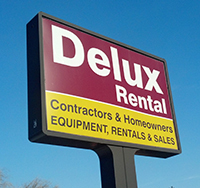 Since 1966, Delux Rental has been a leader in the equipment rental industry by retaining the "family approach" and ensuring each customer gets the service and equipment that he or she needs. We understand that renting equipment can be complicated. It doesn't matter if it's an electric floor sander or a Bobcat excavator, we're there to help you out! We are dedicated to supplying quality equipment rentals and tool rentals in Ypsilanti and Ann Arbor as well as the surrounding Southeastern Michigan area. Specializing in contractor and homeowner rentals, our customers have come to trust our outstanding service in providing all sorts of machinery from heavy equipment to small hand tools. If you're unable to find what you're looking for, don't hesitate to pickup the phone. We pride ourselves on providing remarkable customer service so you can get your projects moving!